-Varies as a function of the wavelength used in the capture. -Is apparently a diffraction effect caused by the telescope aperture itself. Celestron C14, Televue 2.5 x Powermate. Final FL (measured) 9200 mm. Camera Point Grey Flea3. apparent surface features on the Jovians moons as well. But are those actual features on the moons or artifact? complex artifacts in a composite RGB image. Can one, with amateur equipment, resolve real surface features of the Jovian moons or similar diameter bodies? 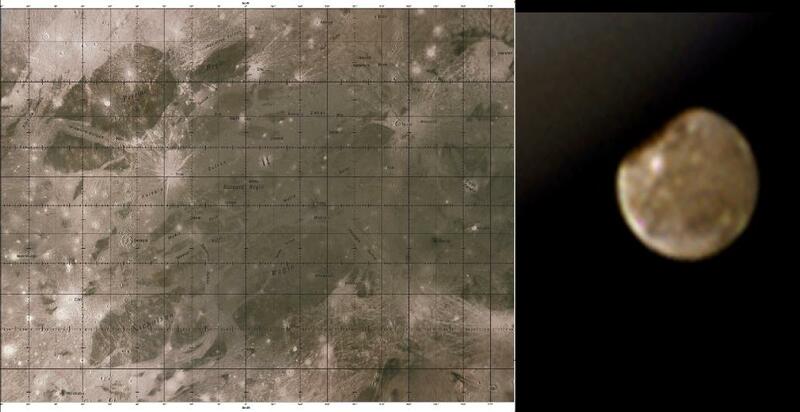 USGS map of the surface of Ganymede, in Mercator projection but cropped to show the visible face of Ganymede. constant). Perhaps the artifact could then be subtracted out. features on the face of the moon visible at that time. using the Graphics Ephemerides feature of WINJUPOS.